ALL "SLOT" RESTRICTIONS PLACED ON EQUIPPABLE SPECIAL ABILITIES (*NOT AUGMENTS) BE REMOVED; SUCH THAT, ONLY THE SPECIAL ABILITIES THAT CLASH DIRECTLY WITH ONE ANOTHER (E.G., JACQUI BRIGG'S ROCKETS AND BLUE ENERGY PROJECTILES) ARE RESTRICTED FROM BEING USED SIMULTANEOUSLY BY A SINGLE CHARACTER 'LOAD-OUT'. "I think this is pretty lame. No customization ruins a lot of creativity IMO "
"Its just really disappointing to me that as a competitively player I have to completely ignore the one thing I was looking forward to in the game’s release. Please reconsider making UI for tourny play in the future. Yall already got an attribute menu in play." "I just dont want devs to dictate tourny rules again for the second game in a row rather let us explore our options but, their money their rules. ughh"
Last edited by DeBane; 04-02-2019 at 08:25 PM. Or add more slots for each character. However, if their implied claim for having a "slot" restriction in the first place, was for "balance" -- now borne out as either a blatant lie, or a back-pedal that came after the realisation that system did not work as intended (vis., bringing back developer-locked variations) -- then why, in light of the so-called "customisation" being limited to "casual" mode/s, are they needed at all...? They need to clearly separate the "competitive" and "casual" incarnations using a distinct boundary. If they do not, they will invariably deliver an underwhelming product, because of the near-impossibility of catering to both casual and competitive demographics that fighting game development has long proven to be. The simple solution for this is to remove all ability usage limitations in casual mode/s (*aside from abilities that clash directly). That way, casuals can have fun (why else even play, if not for fun? ), and the e-sport$ can bask in their precious rote BnB spammy "balance" -- win-win. 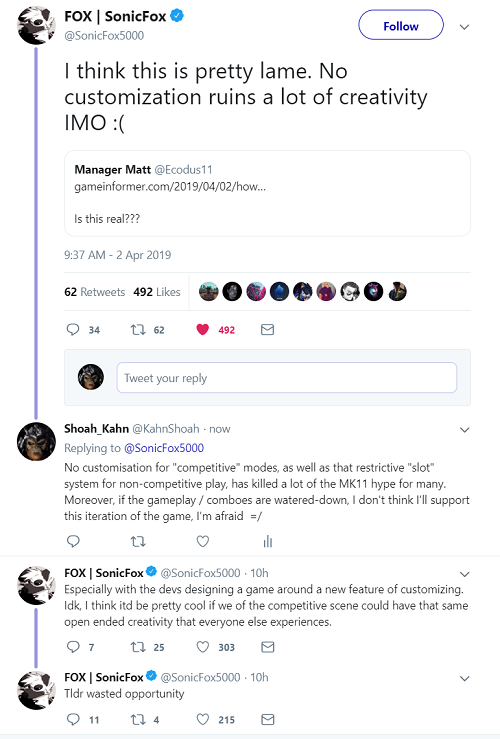 (NB: Obviously, SonicFox is a arguing for the current "slot" system to be open for competitive play... However, that would take longer to balance than a mere three weeks. Instead, by giving non-competitive players carte blanche with the game's customisation potential, they will not only leave competitive play unaffected, but, it will also allow players to actually TEST what abilities really do break balance -- in turn, making the tweaking of a potential "slot-based" system that much quicker and for SF's request to become a reality.). The "balance" argument, with respect to "slots" and non-competitive modes, is dead in the water, now that the customisation (such that it is) no longer affects e-$port$ or lagline ranked. Why leave some remnant of a fun-killing "balancing tool" in the game when it's no longer needed...? Request: Mileena's "Be Mine" Fatality in "MK3 Costume"
Is the "Tower" and the "Evil Monastery" the same?